Rotary Die cutting is an extremely accurate and quick process for creating unique products made from a wide range of materials. There are several ways to die cut, including, flatbed, matched metal and rotary. This custom die cutting process is an extremely versatile way to create, cut, shape and form products made from sheet or roll plastics. Rotary precision die cutting also allows for high volumeroduction runs. Precision die cutting operates by utilizing cylindrical die(s) that cut against a hardened anvil roll. The die cutting machines are controlled by servo motors that allow for precise die cutting control and registration of parts. Through the rotary die cutting process materials are fed from unwound spindles and are then die cut and rewound or supplied as discrete parts. Multiple materials can also be laminated together and die cut pressure sensitive adhesives can be applied so the parts can be supplied on a liner. This rotary die cutting process also makes it easy to create custom die cut foam and custom die cut gaskets with complex features and shapes. Rotary die presses allow for consistent accuracy and high speed converting of various flexible materials. 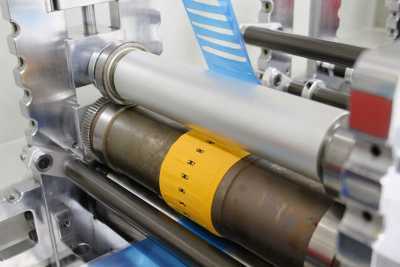 Rotary die presses can be set up to die cut and kiss cut, while laminating, scoring and sheeting in line. The web width of the rotary die press may determine the width of the material being used, the size of the rolls and how many processes may be designed into the fabrication process. Both the fabrication process and the rotary die cutting of parts entail detailed preparation and engineering. If you need custom parts as single prototypes or full production runs, if you need twenty parts a month or two million, Fabri-Tech can manufacture the products you need in some of the fastest turnaround times in the industry. No order is too large or too small for our rotary die cutting services. After your order is completed, we will store the tooling and design information used to create the custom parts, making reorders and additional production a fast, easy process. All customer design data is kept strictly confidential—Fabri-Tech will never share this information with any unauthorized third party. We will work with you to perfect your designs for maximum manufacturing efficiency and to select the right materials for your design and for the function of the part being produced. There are no limitations to the parts and components we can create via rotary die cutting—anything you can imagine, we can help make a reality. Fabri-Tech works from your unique designs to create parts and products that meet the specific needs of your project. Using your CAD files, design drawings, or even just notes scribbled on scratch paper, Fabri-Tech can create custom insulation, foam parts, adhesive gaskets, and more via rotary die cutting. With our rotary die cutting capabilities, we can create parts that match the exact design specifications of products used in a broad range of industries. Multiple different materials can be integrated into your designs in different production stages, with minimal operator interaction and downtime. This keeps production times short to help your project stay on track. Contact Fabri-Tech to learn more about our custom rotary die cutting processes. Or request a quote for the rotary die cut parts your next project requires.